Outside the Lines Penguin Putnam Inc. 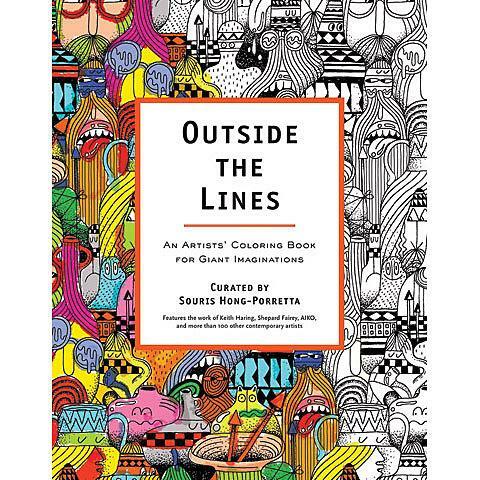 This coloring book features original line drawings from more than 100 contemporary artists and is intended for anyone who loves creativity and contemporary art, or for someone who simply loves the joy of coloring. It contains a striking collection of illustrations from more than 100 creative masterminds including animators, cartoonists, fine artists, graphic artists, illustrators, musicians, outsider artists, photographers, street artists and video game artists. It includes contributions from Keith Haring, AIKO, Shepard Fairey, Exene Cervenka, Keita Takahashi, Jen Corace, Ryan McGinness and more. The book features edgy and imaginative pieces that are ready for artists to add their own special touch.